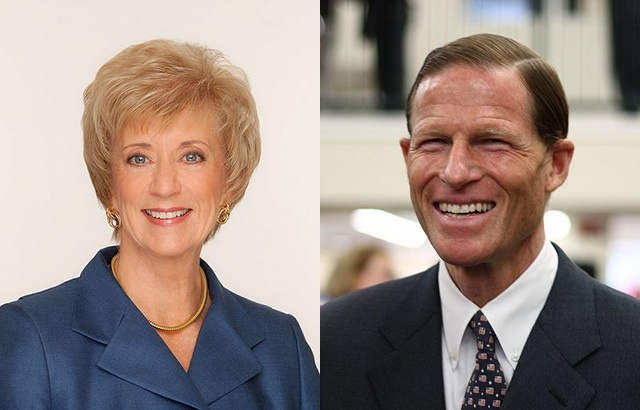 The new Rasmussen is pretty convincing: Blumenthal 56, McMahon 43 (MoE 4). That’s a 95/5 split and not indicative at all of a competitive race. Further, it’s the fourth consecutive double digit lead for the Democrat. Before being up 13 in Rasmussen he was up 12 in Quinnipiac, 11 in Fox/POR, and 18 in the Suffolk University Poll (for what it’s worth). The polls that had still been showing McMahon close were the Rasmussen and Fox polls, but they now have swung 8 and 6 points respectively for Blumenthal. That’s clear movement confirmed by other polls. This race is not particularly competitive anymore and there’s precious little time for McMahon to change that.